FreeCAD is a general purpose feature-based, parametric 3D modeler for CAD, MCAD, CAx, CAE and PLM, aimed directly at mechanical engineering and product design but also fits a wider range of uses in engineering, such as architecture or other engineering specialties. It is 100% Open Source (LGPL2+ license) and extremely modular, allowing for very advanced extension and customization. FreeCAD is based on OpenCasCade, a powerful geometry kernel, features an Open Inventor-compliant 3D scene representation model provided by the Coin 3D library, and a broad Python API. The interface is built with Qt. 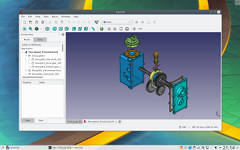 FreeCAD runs exactly the same way on Windows, Mac OSX, BSD and Linux platforms.